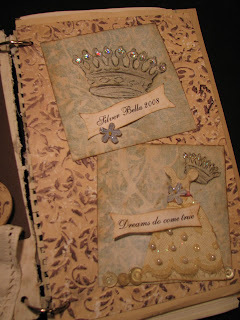 One of the Silver Bellas swaps I was involved in was Junkin' Journals, hosted by Ali. 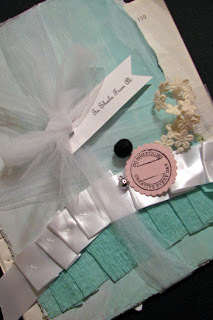 Each person was to include beautiful papers both old and new, and vintage inspired element(s). Each package was beautifully wrapped. 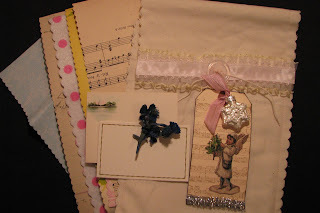 All the beautiful papers and embellishments were tucked into this homemade fabric gift bag. Isn't it gorgeous? Then Ali gave us the front and back to our journals. The night of the swap we exchanged our packages and then when we got back to our room where we delighted in being able to open each beautifully wrapped package. 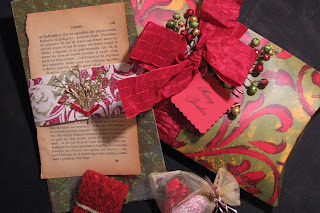 The luscious papers and beautiful embellishments were a treat for the eyes and touch. 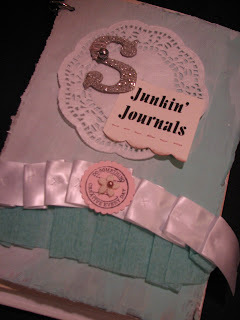 This evening, I finally took the time to start creating my junkin' journal. As I sat creating I realized I was truly nuturing my soul. It felt good to be able to play with all of the yummy goodies and just enjoy the process of creating. This is my journal for Silver Bella; a place to showcase my pictures and new techniques that I learned in class. And to remind myself that dreams do come true. I just adore your blog. You are very creative!!! Hi Sheila, Every page is a work of art. I bet you are reminded of the wondeful time you spent at Silver Bella. I hope someday to be able to attend. Your journal turned out beautiful! Everytime I see anything from Silver Bella I know that I HAVE to go next year. 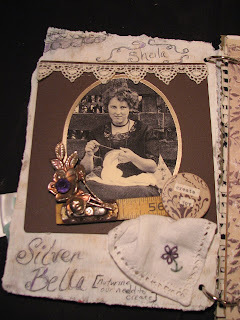 Sheila, Love the old box on your wall and what you've done to accessorize it!